These capabilities enable rapid testing and refinement of different combinations of "seed" concepts to obtain better desired results. According to DeepLearning4J's Word2Vec tutorial, "Given enough data, usage and contexts, Word2vec can make highly accurate guesses about a word’s meaning based on past appearances. Those guesses can be used to establish a word’s association with other words (e.g., 'man' is to 'boy' what 'woman' is to 'girl'), or cluster documents and classify them by topic. Those clusters can form the basis of search, sentiment analysis and recommendations in such diverse fields as scientific research, legal discovery, e-commerce and customer relationship management." Word2vec is a two layer artificial neural network used to process text to learn relationships between words within a text corpus. Word2vec takes as its input a large corpus of text and produces a high-dimensional space (typically of several hundred dimensions), with each unique word in the corpus being assigned a corresponding vector in the space. This "word embedding" approach is able to capture multiple different degrees of similarity between words. To create the model of relationships between the words, a particular grouping of text or documents is fed to the word2vec process, which is called the training corpus. 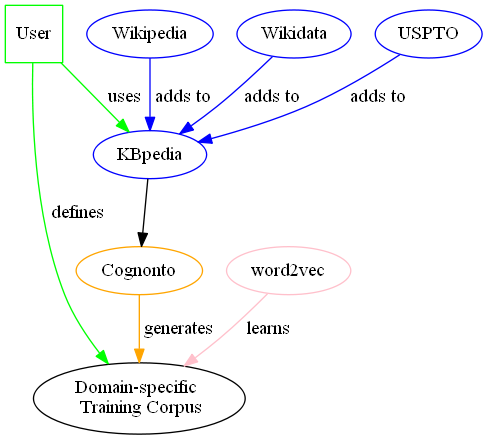 This use case shows how the KBpedia knowledge structure can be used to automatically create highly accurate domain-specific training corpuses that can be used by word2vec to generate word relationship models, often with superior performance and results to generalized word2vec models. The basic approach in this use case is not only applicable to word2vec, but to any method that uses corpuses of text for training. For example, in another use case, we will show how this can be done with another algorithm called ESA (Explicit Semantic Analysis). It is said about word2vec that "given enough data, usage and contexts, word2vec can make highly accurate guesses about a word’s meaning based on past appearances." What this use case shows is how the context of the training corpus may greatly impact the results. This use case also shows how KBpedia may be leveraged to quickly create very responsive domain-specific corpuses for training the model. A training corpus is really just a set of text used to train unsupervised machine learning algorithms. Any kind of text can be used by word2vec. The only thing it does is to learn the relationships between the words that exist in the text. However, not all training corpuses are equal. Training corpuses are often dirty, biaised and ambiguous. Depending on the task at hand, it may be exactly what is required, but more often than not, such errors need to be fixed. Cognonto has the advantage of starting with clean text. When we want to create a new training corpus, the first step is to find a source of text that could work to create that corpus. The second step is to select the text we want to add to it. The third step is to pre-process that corpus of text to perform different operations on the text, such as: removing HTML elements; removing punctuation; normalizing text; detecting named entities; etc. The final step is to train word2vec to generate the model. Word2vec is somewhat dumb. It only learns what exists in the training corpus. It does not do anything other than "read" the text and then analyze the relationships between the words (which are really just groups of characters separated by spaces). The word2vec process is highly subject to the Garbage In, Garbage Out principle, which means that if the training set is dirty, biaised and ambiguous, then the learned relationship will end-up being of little or no value. A domain-specific training corpus is a specialized training corpus where its text is related to a specific domain. Examples of domains are music, mathematics, cars, healthcare, etc. In contrast, a general training corpus is a corpus of text that may contain text that discusses totally different domains. By creating a corpus of text that covers a specific domain of interest, we limit the usage of words (that is, their co-occurrences) to texts that are meaningful to that domain. As we will see in this use case, a domain-specific training corpus can be quite useful, and much more powerful, than general ones, if the task at hand is in relation to a specific domain of expertise. In the past, the major problem with domain-specific training corpuses was that they were costly to create. These costs arose because it is necessary to find a source of data to use, and then to select the specific documents to include in the training corpus. This can work if we want a corpus with 100 or 200 documents, but what if you want a training corpus of 100,000 or 200,000 documents? Then it becomes a problem. To show how this process works, let's create a domain-specific training corpus using KBpedia about, say, musicians. We will compare this domain-specific corpus to the general word2vec model created by Google based on news sources that has about 100 billion words. The Google model contains 300-dimensional vectors for 3 million words and phrases. We will use the Google News model as the general model to compare the results/performance to our domain-specific musicians model. The first step is to define the scope of the domain we want to create. For this use case example, we want a domain that is somewhat constrained to create a training corpus that is not too large for demo purposes. The domain we have chosen is musicians. This domain is related to people and bands that play music. It is also related to musical genres, instruments, music industry, etc. To create this domain, we beginwith a single KBpedia reference concept: Musician. If we want to broaden the scope of the domain, we could have included other concepts such as: Music, Musical Group, Musical Instrument, etc. Once we have determined the scope of the domain, the next step is to query the KBpedia knowledge base to aggregate all of the text that will belong to that training corpus. The end result of this operation is to create a training corpus with text that is only related to the scope of the domain we defined. What this code does is to query the KBpedia knowledge base to get all the named entities that are linked to it, for the scope of the domain we defined. Then the text related to each entity is appended to a text file where each line is the text of a single entity. Given the scope of the current use case, the musicians training corpus is composed of 47,263 documents. With a simple function, we are able to aggregate 47,263 text documents highly related to a conceptual domain we defined on the fly. All of the hard work has been delegated to the knowledge base and its conceptual structure. (In fact, this simple function leverages 8 years of hard work). The next step is a common one related to any NLP pipeline. Before learning from the training corpus, we should clean and normalize the text of its raw form. We remove all of the characters that may cause issues to the tokenizer used by the word2vec implementation. We also remove unnecessary words and other words that appear too often or that add nothing to the model we want to generate (like the listing of days and months). We also drop all numbers. By the way, such cleaning steps are common to most such models, and can be used repeatedly across projects. What is important to notice here is the number of parameters that can be defined to train word2vec on a corpus. In fact, word2vec can be sensitive to parametrization. In a standard use case, since creation of the domain-specific training corpus is so easy, most of the total time getting great results is spent tuning these parameters (subjects of other use cases). Now that we have a domain-specific model related to musicians and a general model related to news processed by Google, let's start playing with both to see how they perform on different tasks. In the following examples, we will always compare the domain-specific training corpus with the general one. A characteristic of words is that their surface form can be ambiguous; they can have multiple meanings. An ambiguous word can co-occur with multiple other words that may not have any shared meaning. But all of this depends on the context. If we are in a general context, then this situation will happen more often than we think and will impact the similarity score of these ambiguous terms. However, as we will see, this phenomenum is greatly diminished when we use domain-specific models. What we want to check is the relationship between 3 different music instruments: piano, organ and violin. We want to check the relationship between each of them. As we can see, both tuples have a high likelihood of co-occurrence. This suggests that these terms of each tuple are probably highly related. In this case, it is probably because violins are often played along with a piano. And, it is probable that an organ looks like a piano (at least it has a keyboard). The surprising fact here is the apparent dissimilarity between piano and organ compared with the results we got with the musicians domain-specific model. If we think a bit about this use case, we will probably conclude that these results makes sense. In fact, organ is an ambiguous word in a general context. An organ can be a musical instrument, but it can also be a part of an anatomy. This means that the word organ will co-occur with piano, but also to all other kinds of words related to human and animal biology. This is why they are less similar in the general model than in the domain one, because it is an ambiguous word in a general context. Now let's see another similarity example between two other words album and track where track is an ambiguous word depending on the context. As expected, because track is ambiguous, there is a big difference in terms of co-occurence probabilities depending on the context (domain-specific or general). However, are domain-specific and general differences always the case? Let's take a look at two words that are domain specific and unambiguous: pianist and violinist. In this case, the similarity score between the two terms is almost the same. In both contexts (generals and domain specific), their co-occurrence is similar. Now let's look at the similarity between two distinct words in two new and distinct contexts. Let's take a look at a few words and see what other words occur most often with them. One observation we can make is that the terms from the musicians model are more general than the ones from the general model. As we know, track is ambiguous. The difference between these two sets of nearest related words is striking. There is a clear conceptual correlation in the musicians' domain-specific model. But in the general model, it is really going in all directions. This one is quite interesting too. Both groups of words makes sense, but only in their respective contexts. With the musicians' model, year is mostly related to awards (like the Grammy Awards 2016), categories like "song of the year", etc. In the context of the general model, year is really related to time concepts: months, seasons, etc. Finally we will play with manipulating the co-occurrences vectors by manipulating them. A really popular word2vec equation is king - man + women = queen. What is happening under the hood with this equation is that we are adding and substracting the co-occurence "vectors" for each of these words, and we check the nearest word of the resulting co-occurence vector. Now, let's take a look at a few of these equations. Pianist + Renowned = ? These kinds of operations are also interesting. If we add the two co-occurrence vectors for pianist and renowned then we get that a teacher, an educator, a composer or a virtuoso is a renowned pianist. For unambiguous surface forms like pianist, then the two models score quite well. The difference between the two examples comes from the way the general training corpus has been created (pre-processed) compared to the musicians corpus. Metal + Death = ? This example uses two quite general words with no apparent relationship between them. The results with the musicians' model are all the highly similar genre of music like trash metal, deathcore metal, etc. However with the general model, it is a mix of multiple unrelated concepts. Metal - Death + Smooth = ? Let's play some more with these equations. What if we want some kind of smooth metal? This one is also quite interesting. We substracted the death co-occurrence vector to the metal one, and then we added the smooth vector. What we end-up with is a bunch of music genres that are much smoother than death metal. In the case of the general model, we end-up with "smooth metal". The removal of the death vector has no effect on the results, probably since these are three ambiguous and really general terms. To enable the testing and refinement of different combinations of "seed" concepts to produce training corpuses with the desired set of similarity results. As we saw, creating domain-specific training corpuses to use with word2vec can have a dramatic impact on the results and how results can be much more meaningful within the scope of that domain. Another advantage of a domain-specific training corpus is it creates create much smaller models. Smaller models are faster to generate, faster to download/upload, faster to query, and consume less memory. Of the concepts in KBpedia, roughly 47,000 of them correspond to types (or classes) of various sorts. These pre-determined slices are available across all needs and domains to generate such domain-specific corpuses. Further, KBpedia is designed for rapid incorporation of your own domain information to add further to this discriminatory power.